To all readers of this blog I wish you a Merry Christmas and Happy New Year. I thank you for taking the time to read and comment on what I produce here. Remember to take some time off and spend with family and friends as it is important to have some down time as 2014 I think is going to be even more hectic than 2013 was. So enjoy, stay safe and thanks for staying tuned. In this podcast episode we discuss why financial reporting and accounting is so important to profitably managing your Cloud Business. 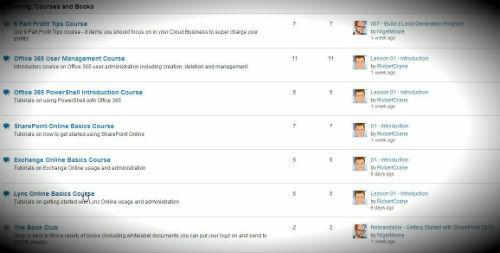 We’ll highlight the 4 major reports that you should be reviewing daily and why. We’ll then take a deeper dive into each of these to give you a better idea of what role they play in your business. We cover Profit & Loss, Balance Sheet, Cash Flow Reports and Budgets. Four very important financial and accounting reports you should be keeping an eye on when managing your Cloud Business. Rob relays some recent examples of good and bad customer service he has been subjected to and we answer the question about when is the right time to be talking to your clients about cloud services. Wow! turns out that our Cloud Business Blueprint podcast made the New and Noteworthy section of iTunes. Episode 5 is about to be released. When you do listen we’d really appreciate any feedback or ratings you can provide as it all helps us create a better result for our listeners. Getting Started with SkyDrive Pro for Office 365. Not what it purports to be: I found this book to be totally corporate oriented. When I bought it, my thought was to understand Skydrive and how it works better. This book fails on all counts. After skimming it, I was sorry I even bought it. Stay away unless you are in a corporate environment. Now my first reaction, especially to the review title, has annoyance as I certainly believed that both the title and the description were valid. However, upon reflection I can see where the problem lies. Office 365 has a Home Edition that also includes SkyDrive but the consumer version NOT the Pro version. So this person would seem to have Office 365 Home Edition and was looking for information about SkyDrive, bought my book and was disappointed because my book only covers the business versions of Office 365. Now I do understand that Microsoft is trying to unify its products and brand all under one cloud banner but it is still very confusing for end users. Even I had to stop and look at this from the point of view of someone who has purchase Office 365 Home and wants information on SkyDrive and how easily it would be to confuse my book on Office 365 Business and SkyDrive Pro. It is so easy as technology people who understand the differences between products like SkyDrive and SkyDrive Pro to overlook the fact that the vast majority of end users struggle to differentiate the products. It also highlights how you have to really, really specific with these cloud offering to ensure you are targeting exactly the right audience. No one is at fault here, it is just confusion around the product editions. I have now updated the description on Amazon to indicate my book doesn’t talk to the Office 365 Home edition and I have left a comment for the reviewer indicating what I believe is where the confusion lies. This means it covers material that is applicable for Enterprise Office 365 Plans and well as for the Small Business and Professionals Plans. It will not cover the consumer version of SkyDrive. However, I do understand how someone using the Office 365 Home edition could still be confused, yet I think the title of the review is a little harsh but I accept that is what happens when you publish publically. So what’s the point of this post? I suppose it is to say always ensure that you avoid confusion in the minds of consumers when it comes to your products. If there is confusion there will be frustration like that experienced by the reviewer and myself as an author both expecting different content from a product of the same name, that being Office 365. That frustration results in negative sentiment when in fact each product provides a great solution for home users and for business. It is unfortunate that they are so dissimilar but share a common name. Oh well, I need to update that SkyDrive Pro book anyway. This is a pretty handy cover for the Nexus 5 in my books. It basically comes in two pieces as you can see above. This first is the case which the phone fits into snuggly. The second is a band that fit around the border to hold it in place, which is easy to attach. The case even has rails to ensure the band fits correctly and stays in place. It is hard to even notice the cover when it is place. It adds very little bulk or weight to the phone and protects it very well. All the guide holes align perfectly and the surface makes the phone nice and grippy. I like simple covers like these because they protect the phone while not making any more cumbersome to use. Certainly would recommend this case to all Nexus 5 users. A few weeks back I let you know about signing up to my new project www.cloudbusinessblueprint.com. We opened the doors on the private members site on Friday night and by Saturday all the Foundation spots where taken. Many people contacted us saying that this was the ONLY weekend that they didn’t check their emails and they were very disappointed to miss out. Thus, after discussions with my business partner Nigel Moore, we have decided to make a similar once off offer. Right now in the community, you already have access to a half dozen training courses along with some templates and eBooks and that’s growing rapidly. Just to make sure you don’t miss out on this one (as we definitely won’t be offering any more discounts on membership). After that membership will be locked and staying at $47 for the time being. We’d love to hear feedback, so please leave your comments below and don’t forget to rate us on iTunes. This will help us grow our listener base which will encourage us to add more value and help us to bring on some fantastic guests. It is very unfortunate that Windows 8 has received a lot of negative press, mainly from those who have never used it! Yep, it works better on a touch device which are not that common yet but if you simply press the Windows Key you end up at the desktop. How hard is that? Windows 8 is certainly a major departure in terms of interface from what most people are used to but anyone who has ever used a tablet or a smart phone should be able to adapt pretty quickly, so I can’t see why some people moan so much?? Are they not using a smart phone? I doubt it. Most of the negativity seems to be coming from those ‘old school’ users who don’t want to learn anything new. However, any new interface always elicits cries of angst. What happened to the day when we couldn’t wait for something new? Have people really become that staid now days? The secret to success with Windows 8 is to spend some time acclimatizing yourself to the new stuff. It doesn’t take long, 10 – 15 minutes is enough for most people to get up to speed and be more productive than they were with previous operating systems. It would have been great if Windows 8 did include its own usage tutorial but it doesn’t and that has counted against it when it comes to adoption. A little bit of digging around the Microsoft site reveals a wonderful training document on Windows 8. I’d recommend that any Windows 8 user download and work their way through the document as it covers a huge amount of the new features in Windows 8. In many cases, once you become familiar with these features you’ll really appreciate how much better than can make your technology experience. Even if you aren’t currently using Windows 8 it is probably worthwhile downloading and going through the document or at least keeping it handy as chances are, one day you’ll be using Windows 8! Before you write Windows 8 off and consign yourself back to your 1980’s machine, go through the Windows 8 End User Training brochure and then use Windows 8 for yourself. I’m pretty sure you’ll find a whole new world with a bit of knowledge under your belt.